Cette grange fabuleuse offre une retraite de luxe pour les amis, les couples et les familles. WiFi et la réception mobile. Ouvrir dîner de cuisine mène dans le salon ouvert avec poêle à bois confortable. Les portes françaises mènent à la pelouse et au patio inclus avec le BBQ. Seulement 5 minutes à pied de la plage Prix Pavillon Bleu Tenby ou une promenade de 10 minutes (avec des vues fabuleuses) au centre-ville de Tenby, avec ses nombreux cafés et galeries d'art. Tout près se trouve le sentier côtier du Pembrokeshire d'où vous pouvez explorer jusqu'à 186 miles de superbes paysages côtiers! Faites un plongeon du matin ou de l'entreprise par le biais kayak turquoise criques minutes. Tentez votre chance à Maquereau pompage ou jeter une ligne au large Tenby port pour attraper une basse! Dans la soirée, profiter d'une promenade au port pittoresque à Tenby et voir les bateaux de pêche à venir avec leurs prises de jour ou simplement vous détendre dans le jardin avec un verre de vin et un délicieux barbecue. We really enjoyed our stay at The Barn, it's a lovely cottage with plenty of room and only 10 minutes from the beach and town (albeit downhill and uphill!). The weather was glorious and the thick stone walls and slate flooring kept the house cool; it was lovely. The one downside was the fact that the reception for the camp site was at the bottom of the road past the Barn - everyone had to pass the Barn (down and back) in order to register there, making the garden not very private to sit in. Unfortunately, most campers thought the Barn itself was the reception and they would stop their vehicle at the side of the house to look over the fence to ask, or some people even came into the garden and up to the door to enquire. Better signs are needed, making it clear which house is the reception - although that would not stop the constant traffic... Still, a great holiday was had by all. Thank you for your review. I’m pleased you enjoyed your stay. Good news.... the reception for the campsite has now moved to the top of the site and is clearly signposted, so there’s will be no more disturbances or lost passers by! We had a wonderful stay at The Barn and would certainly recommend it. It had everything we needed - including cot and high chair - and the beds were extremely comfy! We (2 adults, 2 kids 11 and 12 plus dog) had a fantastic stay at this cottage. It is right on the coastal path, 10 mins walk to Tenby North beach (great family beach, but no dogs). We walked into Tenby and back each evening for dinner and had some great meals. The cottage is a good size and nicely decorated. Beds very comfy. We only ate breakfast here so can't comment on kitchen equipment. We used the hot tub most days. You had to plan ahead as it took 3 hours ish to heat up. Pictures on the website are accurate and owner responded quickly to my emails. Only minor niggles - one of the toilet seats was broken and there were very few glasses, although lots of wine glasses! We would definitely recommend. 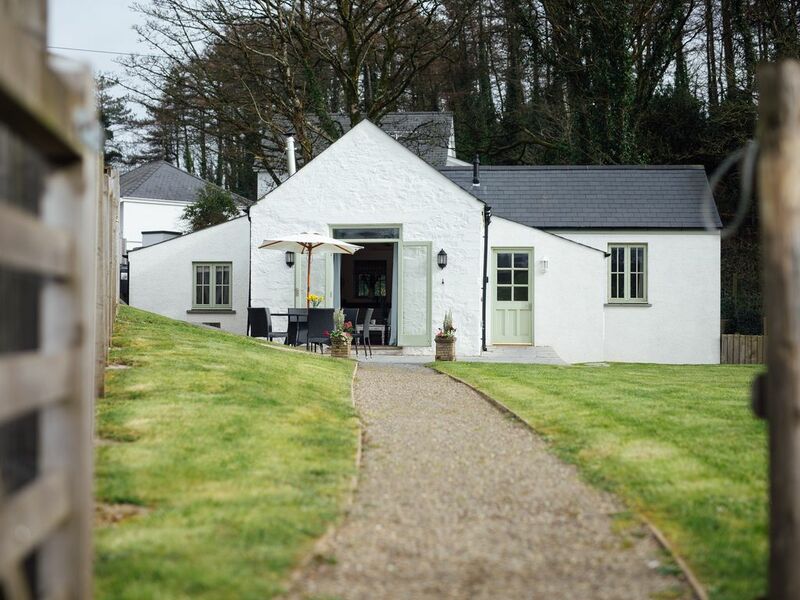 The Barn is a wonderful place to stay, it offers a beautifully decorated, clean, well equipped and relaxing living environment as well as an extremely attractive and peaceful setting very close to Tenby town. The owners were extremely helpful and quick to respondwhen we contacted them about extra towels and have made every effort to make the cottage a lovely place to stay. The parking and proximity to Tenby is a rare and valuable bonus as the town is lovely but busy. At the barn you can have the best of both worlds as truly fantastic walks as well as easy access to shops and restaurants are readily available. We would heartily recommend this property to anyone without hesitation and very much hope to return some time in the future. A wonderful clean , spacious modern cottage, tucked away but with easy access to the north beach and Tenby town. Spotless ,well equipped and comfy beds.. Contacted owner in our return as we had managed to leave something and she offered to post back to us straight away. Plenty of cafes and restaurants, further afield Saundersfoot is a pretty little bay to visit. Lots in the area for children to explore. We've been to Tenby for the last three years, usually staying in apartments near the beaches. We wanted a bit more space this year and The Barn seemed ideal. On arrival, we were gobsmacked by the beauty of the place. It's up a hill from the town, but only half a mile from the shops (easy on the way down!). There is parking and a lovely enclosed garden which was ideal for our dog (we could let him out the door without worrying he would run off). The open plan living, dining and kitchen area is well equipped with everything you could need (including a DVD/Bluray player!). The slate floor is heated which makes the place warm and cozy (we didn't need to use the woodburner). Three lovely bedrooms ideal for us and the three kids. The main bathroom is nice and airy and well equipped and there is a separate cloakroom and loo (again ideal when you have more than one child!). The owners have also put in an "eco" hot tub in the garden, and there is a small shed with BBQ, chair cushions etc. The Barn is far enough outside of town for it to be so peaceful. Sitting outside in the evening, watching the sun go down is just fantastic. And once the woodburner heats the hot tub (it did take a good 3-4 hours!) it's just lovely to sit in there listening to the owls hoot. The Pembrokeshire coastal path is just to the side of the property, and would recommend a walk across to Waterwynch beach - a very secluded beach with a private house on it, but at low tide lots of rocks to climb, caves to explore etc (and the house is nearly £6000 for a weekend stay!). Tenby is a really beautiful place - fantastic beaches (our favourite is South Beach - dog friendly, and small car park right on the beach). Plenty of little bistros, cafes and restaurants in the town. We always visit Folly Farm too - not sure if this place is an amusement park, farm or zoo - probably all three, but the kids loved it. All in all, a really lovely place to stay, well equipped, clean, quiet and in an ideal location. Thanks Emma - we may well be back! Notre belle grange est situé à North Cliff, l'un des plus recherchés après les endroits à Tenby. Ce est dans un cadre rural paisible, juste à côté du sentier côtier du Pembrokeshire et à distance de marche de la vieille ville pittoresque et charmant de Tenby, avec ses rues, de plages de sable fin, coloré port animé, magasins, cafés, bars et restaurants pavées. La plage la plus proche (200 m) a été décerné un prix Pavillon Bleu. Il descend en pente douce et est parfait pour les enfants et les adorateurs du soleil de même! Siroter un Latte sur la place ou de prendre une excursion en bateau à la superbe île de Caldey et profiter de la merveilleuse faune marine! À proximité Barafundle Beach est un must (voté l'un des meilleurs dans le monde!) Acivities pour tous les âges. Enfants et adultes vont adorer les Sea Safari & voyages de pêche, sports nautiques, Welsh Zoo d'Anna, le parc des dinosaures, parc à thème Oakwood, Heatherton extérieure Centre d'activités, parc Bluestone eau, Gokarting, Quad Bikes, Musées d'art & Châteaux (le tout dans un 15 minutes en voiture). Les marcheurs seront dans le ciel avec 186 miles de Parc national de sentiers côtiers et des paysages à couper le souffle sur le littoral porte. Autres Activités locales:, karting, canyoning.